Another day at the office for #16. I love this photo. We're 4-0. Undefeated in non-conference play for the 3rd consecutive year. Michigan is 12-0 in September over the last 3 years. Not a bad start to 2011, eh? One of the many highlights for me yesterday -- Brady's final comment from his post-game press conference. Four weeks in, is there anything about this team good or bad that surprises you? “I like how they like each other. I’ve been around teams that don’t like each other. I like how they like each other -- if they like each other enough and respect each other enough, they’re going to play for each other. And that’s a powerful thing. When they play for each other and they play for Michigan, that’s a powerful thing. Reading this quote after the fact only reveals what he said. But watching him deliver this quote to a room full of media members, it was one of my favorite Brady Hoke moments. A lot of coaches say things and you're never quite sure how much they believe what they're saying. With Hoke, and this comment above, there was no question. More on the post-game presser below. 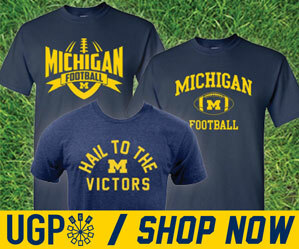 MGoVideo has game video from each quarter in it's entirety. I was able to snap a couple photos of Brady embracing a few Aztec players on the field after the game. Check out my photo set here. I was really surprised to see how much emotion the Michigan coach and his former players were showing. But, it makes sense --those are his guys. He is their coach. Greg from MVictors addresses this, and other SDSU topics here. As far as the game was concerned. Just a few bullets. • Game balls go to the entire defense. They stepped up today, big time. I heard a stat that SDSU had the ball on the M side of the fifty 11 times, but only walked away with one touchdown. That's old school Michigan defense numbers. We were able to capitalize on turnovers, and the front 7 really came to play. Along the line...Van Bergen, Martin, Roh, Campbell...all played well. • Another game ball goes to Al Borges for his first half play-calling. He mixed it up very nicely. But I think the playbook shrank dramatically in the second half with our 21-point lead. • Props to true-freshman Blake Countess for stepping up when Woolfolk and then JT Floyd left the game. JT was able to return, but Woolfolk was not. Blake was able to come into the game and helped the defense not skip a beat even when being tested by Lindley. • I know at some point we're going to be talking about why this offense has no other answer besides #16...and we might be getting to that point. 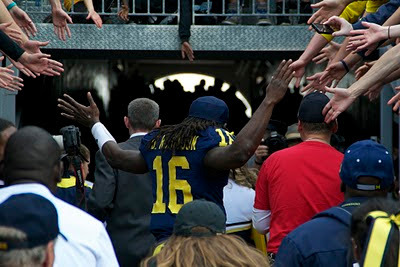 But 4-0 is 4-0...and it's hard not to just assume that Denard is Superman. His ability is just downright amazing. But this offense must become more than just designed QB runs. I think we have the ability at running back, and the line is good enough, we just need to gel faster. But it is a process. • We'll find out next week if this the passing game just took a week off. I know we're not very strong in the passing department, but it was non-existent yesterday. All in all, we're undefeated. I expected this game to be much closer than it was -- I think we all did. Things don't really get tougher with Minnesota visiting this week, but it gets much tougher after that.